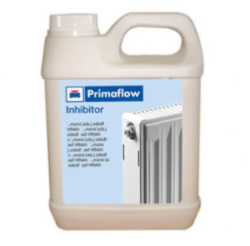 Inhibitor is a multi-purpose treatment, specially designed to protect the entire central heating system from scale, sludge and corrosion. Inhibitor is suitable for use with all commonly encountered plastics and metals including aluminium. To ensure ongoing protection, annual treatment with inhibitor is recommended. Inhibitor does not contain mineral oil. Inhibitor is only suitable for fully indirect systems.